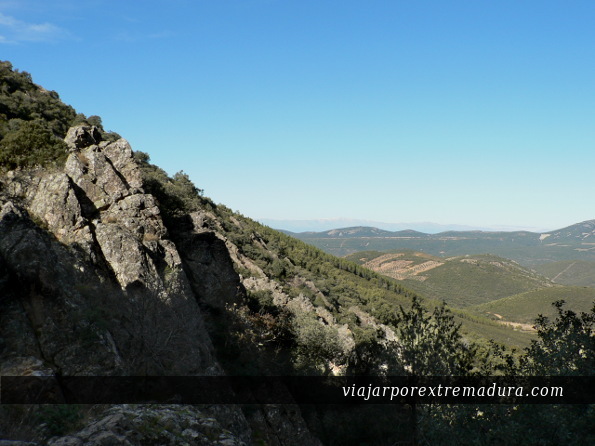 It is a mountainous massif that covers 2,544 km2 in the east area of Extremadura. It is a zone characterized by the biodiversity and its beautiful natural landscapes. The Royal Monastery of Santa Maria de Guadalupe (declared World Heritage Site by UNESCO) is a beautiful monastery whose main buildings starting at 14th – 15th century. It is located in the village of Guadalupe. There are many natural routes to practise walking, trekking or other outdoor activities. It is a pleasure to visit every little town of this zone: Alía, Cañamero, Logrosán, Berzocana, Cabañas del Castillo, Deleitosa, Adeacentenera, Bohonal de Ibor, Castañar de Ibor, Fresnedoso, Mesas, Navalvillar de Ibor, Villar del Pedroso, Carrascalejo, Navatrasierra, Garvín, Valdelacasa de Tajo, Peraleda de San Roman.. The remains of the Roman temple of Augustobriga are now near Bohonal de Ibor. They were taken away few years ago from the waters of the Valdecañas reservoir. In Castañar de Ibor are located the Castañar de Ibor Caves. These caves shows the beauty of karst, resulting in a fascinating world of shapes and colours. Visitors can not access to the caves but can get a lot of info in the visitors centre, located a few meters of the real caves.